While Pinin Farina styled the first series production Ferrari, its body was built by Boano, which was later renamed Ellena, because of a lack of production capacity at the Turin-based carrozzeria. When a replacement was introduced, in 1958, Pinin Farina had expanded its factory and as a result the body for the new 250 GT Coupe was not only styled but also constructed in house. Compared to the Boano/Ellena Coupe it replaced, the new-for-1958 250 GT Coupe was almost identical under the skin. Like its road going and competition 250 GT contemporaries, it was built around a straightforward chassis with two large diameter tubular side-members and suspended by double wishbones and coil springs at the front, and a live rear axle. Stopping power was still provided by sizeable drum brakes. What was reworked was Pinin Farina's exterior design, which featured a significantly lower beltline while the greenhouse grew in size and boasted a curved windshield and rear window. What was retained were the large circular headlights and the typical egg-crate grill. At the rear, a swooping line running underneath the boot-lid between the two light clusters was also a new design feature. Visually, the new 250 GT Coupe was a considerable improvement over its predecessors. Also carried over from the earlier cars was the Type 128 engine, which was rated at 240 bhp. Halfway through the production run, it was replaced by a substantially improved evolution, which featured twin distributors, spark plugs mounted on the outside of the head, coil valve springs and larger Weber carburettors. This Type 128F V12 produced around 260 bhp. Right around the same, the 250 GT Coupe also became the first road-going Ferrari to be equipped with disc brakes. In addition to the Coupe, Ferrari and Pinin Farina also produced a Cabriolet, which incorporated many of the same technical and aesthetic details. After 350 examples were produced, the second generation 250 GT Coupe production ended in 1960. It was later replaced by the 250 GT Lusso, built on a slightly shorter version of the familiar chassis. 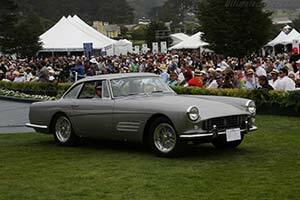 Not quite as sought after as some of the period's other Ferraris, many 250 GT Coupes fell victim to replica builders. It is estimated that less than half of the original production run has survived in 250 GT Coupe form. Fortunately, prices have crept up sufficiently in recent years to make any new conversions highly unlikely.